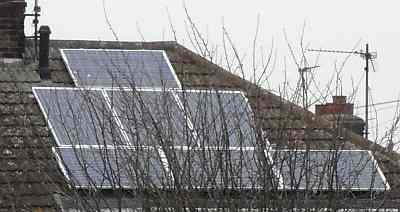 Am I Entitled To Free Solar Panels If I Am Registered Disabled Or On Benefits? I have been asked by a few people if they would be entitled to have free solar panels installed due to their circumstances. People have asked if they get some special consideration if they are retired, on low income, are receiving some type of benefit, are unemployed or are disabled. It is important to understand that although the governments feed-in tariff initiative was partly designed to help low income families the government are not directly targeting any specific group of people. The tariffs pay small energy producers directly for all of the green electricity that they produce. The government are not offering to install free solar panels, the free solar offers currently available are being offered by private companies. As it is private companies offering these panels there is no specific priority put any individual group whether you are on benefits or registered disabled. You have exactly the same chance of having free solar panels installed as anyone else would have. These companies are offering this service at no cost to you because they are able to claim the feed-in tariff payments that are being offered under the government scheme. This essentially funds the private companies to be able to make these types of offer. How do I qualify for free solar panels? In order to qualify for free solar panels there are certain requirements that need to be met. These qualifications are based on your home and not on your own personal circumstances. To find out more about these requirements you can read up on a previous question that has been answered about getting free solar panels here. How can companies afford to give away solar photovoltaic panels? It is obvious that these companies are not doing this out of the kindness of their hearts. The truth is that these companies are making a lot of money by doing this. In a nutshell this is how these types of solar offer are able to be made. Say one of these companies installs £5,000 of solar photovoltaics on your roof. The initial cost of this investment is met by the company themselves. However over the course of the next 25 years that company could claim back as much as £15,000 through the feed-in tariff scheme. If you want to be considered as a candidate you will need to apply directly to one of the free solar panels installers based around the UK. You will need to own your own home in order to be considered. There are however many landlords and housing associations who are applying on their tenants behalf in order for their residents to be able to benefit from the free electricity these panels generate. Apply for free solar panels with our 1 minute application form. Apply Now. For every kWp of solar panels you install you could be earning up to £500 a year. That means a 3kWp system could earn you up to £1,500 a year for 25 years. By getting quotes customers on average save 40% on a solar. Apply for free no obligation quotes if you are looking to invest in solar. Apply Now.